If you are just getting started with account schedules, you need some basic information to get going. This post will show you where to find account schedules in NAV, how to create a new one, and how to name them. We’ll cover both the role-tailored client (RTC) as well as the classic client. 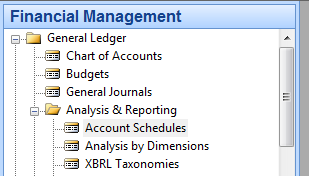 If you’re using NAV with the RTC, choose Departments, then General Ledger from the Financial Management menu, then choose the Account Schedules link under the Reports and Analysis and Analysis & Reporting menus. 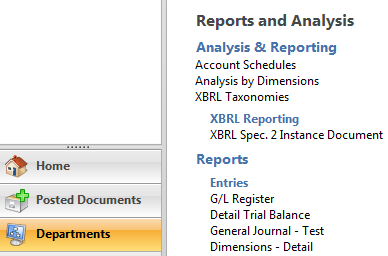 If you’re using NAV 2009 and prior versions with the classic client, choose Financial Management=>General Ledger=>Analysis & Reporting=>Account Schedules. How do you create a new account schedule? In the RTC, creating a new account schedule is made easy with the New button located on the action pane. 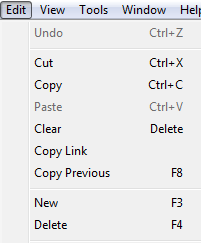 If you’re a keyboard shortcuts person, you can use Ctrl-N, or if you prefer to use menu options, go to Actions=>New. In the classic client, use F3 to create a new record for the account schedule, or select New from the Edit menu. How do you name a new account schedule? Once you’ve created a new report using the RTC, you’ve got 10 characters available for the Name field, and 80 characters available for the Description field. The classic client has the same parameters. Both clients will allow you to use any combination of numbers, letters, or special characters. Keep in mind, that regardless of whether you are using RTC or the classic client, the names you use for the description field will be the default names used when you print account schedules directly out of NAV.